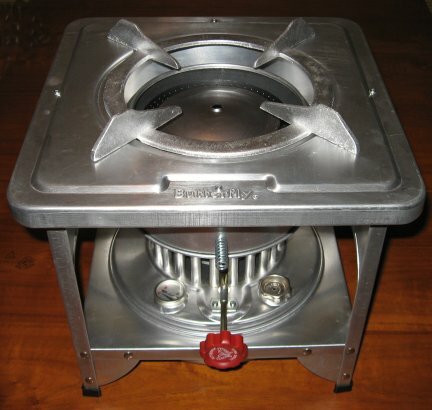 The new Butterfly A-822 may well just be the best kerosene cook stove yet for those looking to store a stove until it is needed, then expect that stove to last for decades of very hard use. Because virtually all parts are made from aluminum, they will not rust in storage. The catalytic cylinders are steel - that is all. And this stove produces enough heat for any canning and baking needs, and do so every day, all day long, for decades. 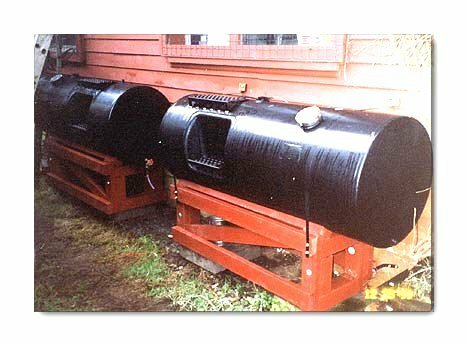 Made in Indonesia, these stoves are used in restaurants throughout Southeast Asia as daily use stoves. How do I rank the Butterfly A-822? 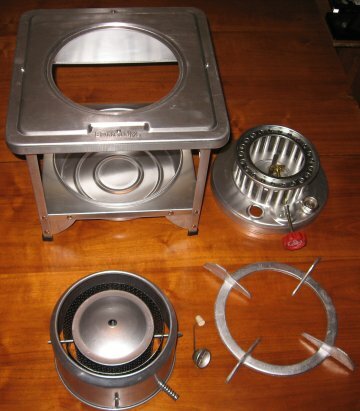 I have all of the multi-wick Butterfly stoves and the 2418 gravity flow stove, plus other assorted kerosene stoves. This stove will do it all. The quality and size are evident. The heat output is sufficient to enable it to work as an emergency heater. And the aluminum construction means it won't rust in storage. There are no glass or fragile parts to break. It is easy to light and use. If I had to have only one kerosene stove to keep in storage until needed - and know it would be there ready to use for all my canning and baking needs, this is the one. The A-822 uses 22 wicks to produce 14,000 BTU/hr of heat. That is easily sufficient for canning and baking when using the Butterfly #2421 oven. The cast aluminum grill on top fits into the base of the #2421 oven and holds it securely. 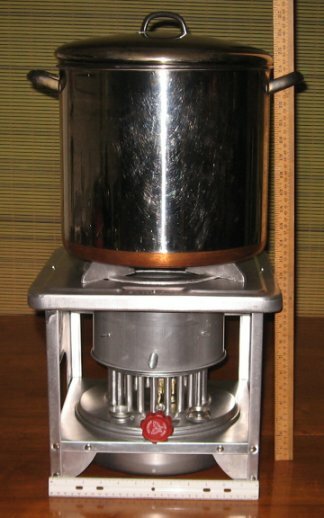 The fuel reservoir safely holds about 3 quarts of kerosene, good enough for about 6 hours of burn time using high heat. Click on all the photos to enlarge them. This stove is easy to use. The square shape with open sides like the #2487 means it is easy to light all 22 wicks. That is a major benefit when the stove has to be used repeatedly all day long! At 6 pounds, 10 ounces it is light enough to easily carry when required. 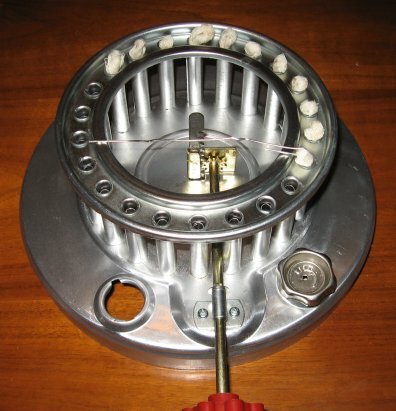 The all-steel 22 wick Butterfly stove #2698 weighs in at almost 10 pounds, for example. "Butterfly" kerosene stoves are available from www.StPaulMercantile.com . St Paul Mercantile is highly recommended. Their prices are low and service is high - a great combination! Disassembly is the first step. At this point every part can be examined so you can be thoroughly familiar with the stove. And now is when each piece is given a coat of liquid auto polish. The polish seals the pores in the metal so spilled liquids are easy to clean up and do not leave a stain. Yes, I know it is aluminum and aluminum does not rust, but it can still oxidize. I apply a coat of auto polish to clean off any preservative oil and protect the finish of any metal stove, heater or lamp as the first step. Then I know it will look good for years. The wicks are installed by pulling them up from the bottom. First, though, the fuel gauge is removed so it does not get in the way. I used a large straightened paper clip to pull the wicks through - it is visible in the right hand photo. The wick riser is at maximum height - the wicks will retract down into the wick tubes. The photo at right shows all the wicks installed. Note that the wicks are in a trough or groove with lips or ribs on each side of them. Those ribs are your height cutting guides. The wicks have been pulled down from the bottom so the tops of the wicks are about level with the guide cutting ribs. The stove can now be assembled and fueled for the first burn. If you are going to store this stove until needed, stop right here before fueling. The next steps can be completed within a few hours and the stove will be ready to use. The first burn should be done outside because there will be fumes. The preservative oil on the catalytic converter burner unit will burn off, and they need to get hot enough to properly season and anneal. Adjust the wicks down during this first burn to eliminate any really tall flame spikes that could produce soot. There will be flame spikes during this burn because the wicks are new and not level. 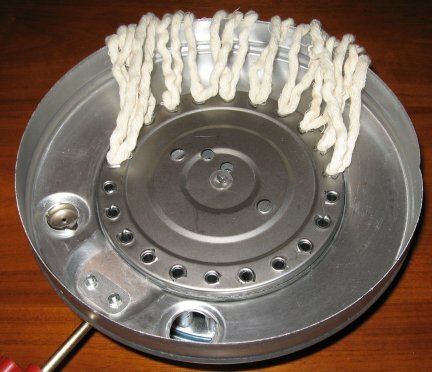 Once the stove cools down completely, the wicks can be leveled so the stove burns without flame spikes. Using pliers, pull the wicks up slightly above the wick slot. Now you can lay a pair or sturdy scissors or shears across the wick cutting guides and trim all of the wicks to the same height. The design of this stove is that as tar and carbon build up on the tops of the wicks, the wicks can be trimmed less than 1/4 inch to get a new burning surface. That is why the wicks are so long - they last a long time even with frequent trimming as needed when the stove is used on a daily basis. Do not let the stove run out of fuel. Turn it off by lowering the wicks. There will be lingering flames after you lower the wicks completely. Let those flame dwindle down for a few minutes before blowing them out. If you don't, the fumes in the catalytic converter will smell quite badly! If you let the stove run out of fuel the wicks will burn down level with the bottom of the wick slot and make pulling them up quite difficult. The Butterfly A-822 is a large stove. 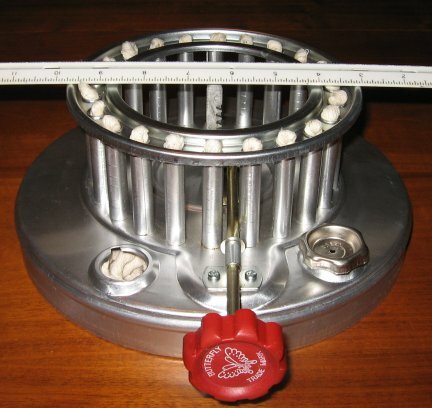 The base is 12" square and the height to the top of the pan bracket is 13 1/2". The size and strength of this stove enables it to easily support even oversize stock pots, as shown in the photo at right. Notice the reinforcing brackets at the corners - it is strong enough for very heavy duty use.